This building was originally constructed by Grand Master Manoel de Vilhena in 1733 but was later acquired by the Scicluna family in 1898. 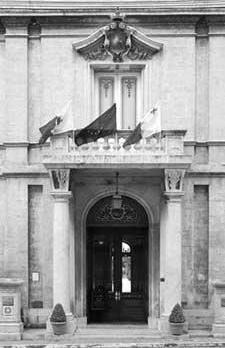 Marquis Scicluna completely refurbished the building into the ultimate memorial of a pretentious noble family. The gardens of the palace were originally vast and incorporated what was until a few years ago the popular Trade Fair grounds. In fact, the elevated pathway and belvedere within the Trade Fair grounds originally formed the end part to the Palazzo Pariso gardens and were used as a vantage point by the owners to oversee the work being carried out in the surrounding fields and long distance vistas of the island. The garden has been split into two; namely (i) the original palace and immediate Italian gardens as one property that is being used as a tourist attraction and as a hall for receptions and (ii) the rest of the gardens that later formed part of the Trade Fair grounds. The palace has a varied history since it housed various different uses. It originally started out as a summer residence and was later used as a barracks by the French Napoleonic troops during their sojourn in Malta, later still as a Jesuit noviciate and college and subsequently used as the stately home of Marquis Giuseppe Scicluna, whose family still owns the palace. The palace was decorated by Italian decorators and is cited as being "unique in Malta for its sheer opulence". Mepa scheduled Palazzo Parisio and its immediate gardens as a Grade 1 national monument and the elevated pathway as a Grade 2 national monument as per Government Notice number 492/068 in the Government Gazette dated June 6, 2006.